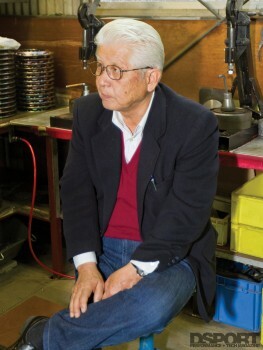 In a quiet neighborhood of Okayama Prefecture, Japan, a legendary engine tuner and manufacturer humbly conducts business. OS Giken (which stands for Okazaki Speed Technical Research), known worldwide for its high-performance engine and driveline components, is the lifelong project of performance fanatic Okazaki-san. DSPORT made the trek to Okayama, Japan for an exclusive visit with OS Giken and Mr. Okazaki. 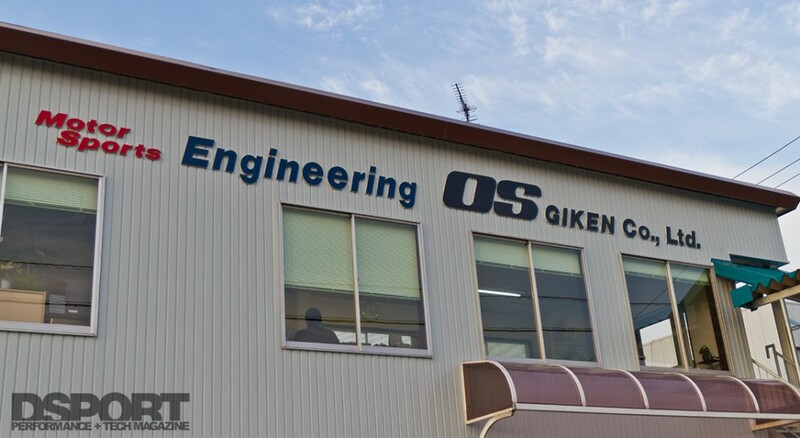 OS Giken was born of a perpetual need for improved performance. 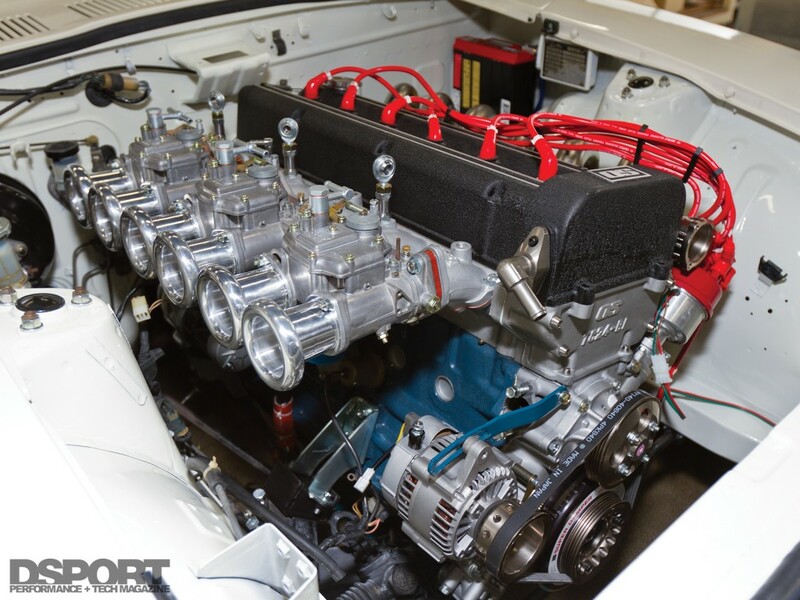 According to Okazaki, a self-educated technician and engineer, he realized the shortcomings of the L16 engines that equipped the Datsun Bluebird in the late 60s. He studied the engine and designed his first cylinder head in 1974, known as the TC16-MA2. Capable of increasing output to 232 horsepower, the TC16 equipped Bluebirds were virtually unchallenged on the streets. In 1980, Okazaki unveiled a limited run of what would become a unicorn in the world of the Z, the TC24-B1 cylinder head. 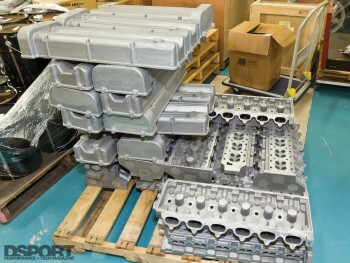 This cylinder head was the product of a personal challenge that Okazaki set for himself (see “Mark of the Z”, DSPORT issue #103, May 2011). 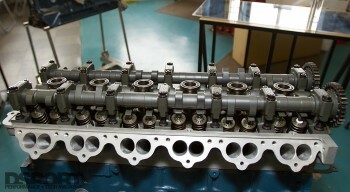 A direct replacement for the single cam, 12-valve head on the L28 engine, the TC24-B1 head was the stuff of legend. It featured dual camshafts, pent-roof combustion chambers and 24-valves that practically doubled the output of the L28 engine. The first stop on our tour took us to the engine division, where we met the chief engineer of engine development, Tohru Takemasa. Clearly, OS Giken did not stop with the L28 engine. 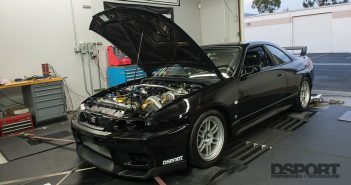 OS Giken embraced Nissan’s next great engine, the RB26DETT, producing a number of upgrades from camshafts to complete RB30 and RB31 engine kits that increase the displacement of the RB engine from 2.6-liters to 3.0-liters and 3.1-liters, respectively. 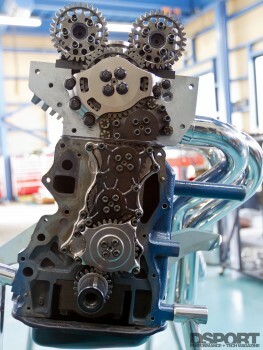 However, as had happened with the older engines, power output had surpassed the capacity of the clutch options of the time, prompting OS Giken to begin the development of clutch solutions to handle the increased horsepower. The next stop on our tour was the clutch engineering division. 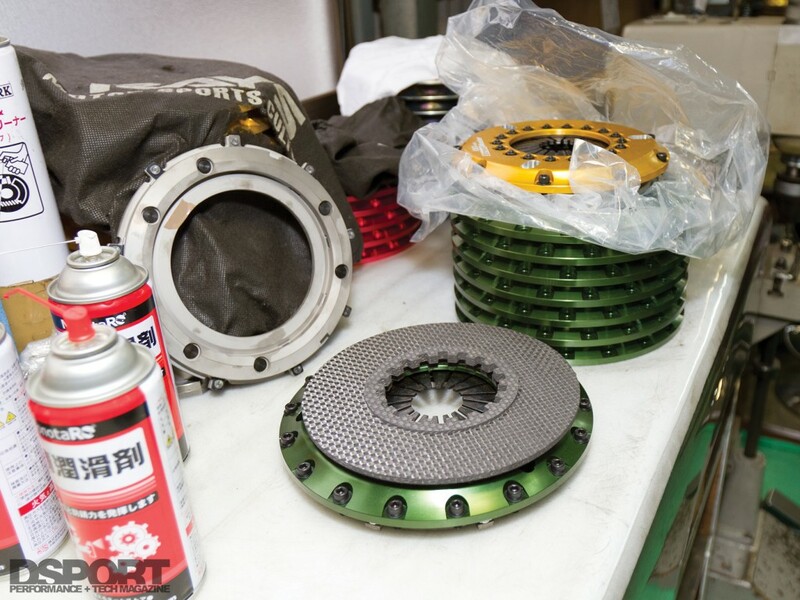 Surrounded by walls lined with flywheels, baskets, clutch discs and covers, chief engineer Hiroyuki Yamagata showcased the latest clutch development project, the twin carbon-disc Street Master clutch. 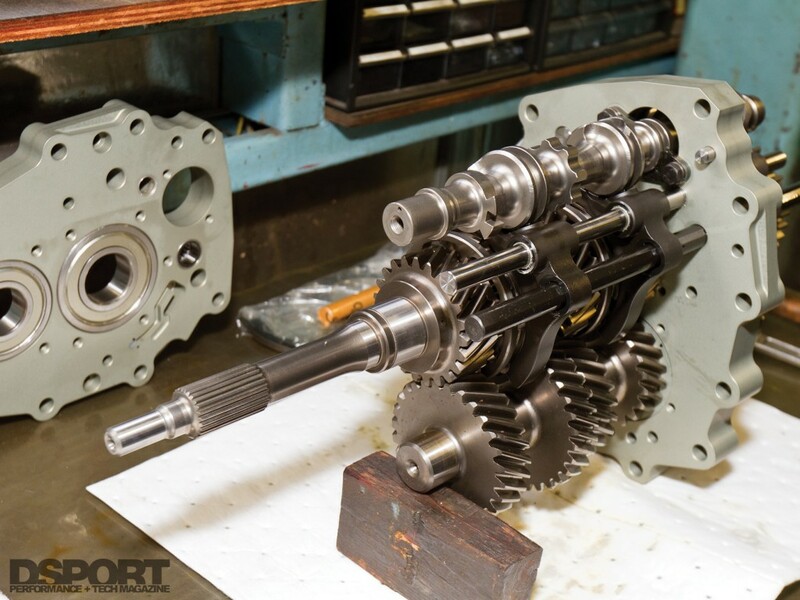 Although it is still in the prototype stage, OS Giken is confident that this clutch will perform well on street applications without the usual chatter associated with multi-plate clutches. Okazaki also directed our attention to a release bearing and fork kit in development that features an adjustable slave cylinder rod and a fork return spring. OS Giken’s grasp of power transfer solutions inevitably led to the next component to fall short, the transmission. 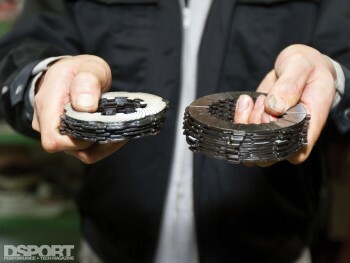 OS Giken is testing out carbon clutch discs on prototype Street Master clutch systems. If put into production, OS Giken states that it should perform flawlessly in day-to-day traffic and occasional weekend track days without the noisy multi-plate clutch chatter. Below the second story main office, we were led to the transmission shop where we were greeted by engineer Ryosuke Sasaki. He had on display another of OS Giken’s original designs, the OS-88 sequential six-speed transmission for the powerful RB-powered Skyline GT-R. On the shelves were numerous gears and shafts for short ratio transmission kits offered for a variety of other platforms as well. He shared some insight with us about the process of transmission development and ways that the OS Giken gear sets improved upon the factory design. The OS-88 remains one of OS’s finest creations capable of handling up to 1,500 horsepower. 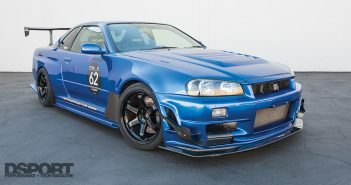 The famous OS-88 sequential transmission for the Skyline GT-R features helical gears with dog engagement and a power capacity of 1,500 horsepower. With engine, clutch and transmission solutions in place, the next obvious driveline component that OS Giken would invest in was the differential. In the 90’s, horsepower development was on the rise, leading to numerous broken driveline parts, including differentials. Once again, dissatisfied with the offerings that were available, OS Giken channeled its energy into developing one of the finest limited slip differentials on the market. Head engineer Takuya Tomimatsu explained the differences between the stock and aftermarket differentials compared to OS Giken’s Super Lock differential. 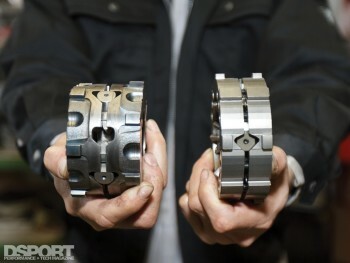 After studying the various designs, a clutch-pack style differential that featured a stronger housing, thinner pressure rings, more discs than any on the market and a 100-percent locking mechanism was born. OS Giken engineered the Super Lock LSD with a revolutionary locking system, thinner pressure rings and more friction discs. 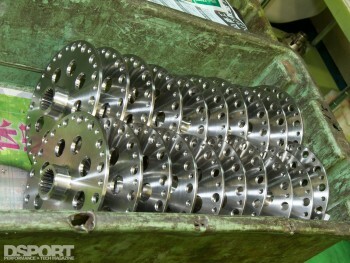 An LSD dyno tests each LSD design to ensure a positive lock. After visiting all of the engineering divisions, we were led into the one building we hadn’t yet seen, the manufacturing facility. 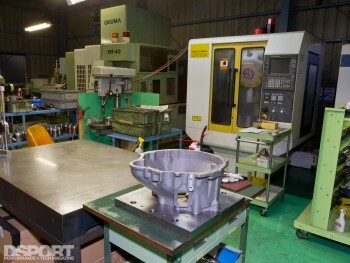 Although OS Giken does not have a foundry on the property, the manufacturing division managed by Yukiharu Izumori runs non-stop, with lathes and CNC machines constantly grinding and cutting metal. 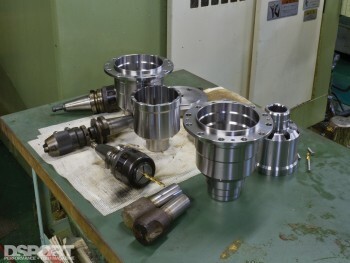 From pistons and differential housings to transmission bell housings, many of OS Giken’s products were seen in various stages of refinement. Just when we thought that our tour was complete, Okazaki led us back to the engine development room once again, unveiling the project that started it all. 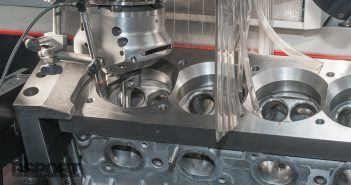 The TC24-B1 cylinder head is the design closest to his heart, but by popular demand, he was prompted to develop a modern redesign, dubbed the TC24-B1Z cylinder head. At first glance, the casting appeared to be a duplicate of the original design. 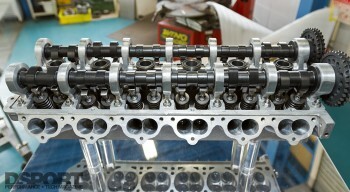 However, Okazaki put a modern spin on his favorite cylinder head, incorporating elements like cam caps and a new gear- drive for the camshafts. His revival project included not only all of the components necessary to fully construct an L28 engine with a TC-24 B1Z head but also an OS Giken header, exhaust, coil-on-plug ignition system and individual throttle bodies with fuel injection. Starting with one man’s vision for more power, OS Giken evolved from a race engine builder to a driveline manufacturer. As we bid farewell to our gracious host Okazaki and his department engineers, we left Okayama with renewed faith in the performance aftermarket. Watch for our OS Giken Shop Tour video coverage and exclusive interviews with Okazaki and the OS Giken staff in DSPORT DVD #27. DSPORT would like to thank Mark Mendoza of Toyota Tsusho/OS Giken USA and Tom Oathoudt for assisting us with interpretation during our visit.